Organic Garden Works: Organic Fertilizer "News You Can Use" and The Sunday "Funnies"
Organic Fertilizer "News You Can Use" and The Sunday "Funnies"
News items on organic gardening you may not find in your favorite news outlet. Organic fertilizer or chemical fertilizer: Discussion on which is better for garden soil: organic fertilizer or chemical fertilizer. The article goes into the benefits of organic fertilizers over chemical fertilizers. One of these benefits is the addition of micro-nutrients. Another benefit is the improvement to the soil structure. However, the article also mentions that, because organic fertilizers contain less nitrogen than chemical fertilizers you must use more, making organic fertilizers cost more. This has not proved to be the case from our experiments. By adding VermaPlex® to the water reservoir, which is diluted at 20:1 to 80:1 with water, the microbes feed upon the organic content of compost and worm castings, releasing sufficient nitrogen and nutrients for the plants without the addition of any chemical fertilizers at all. 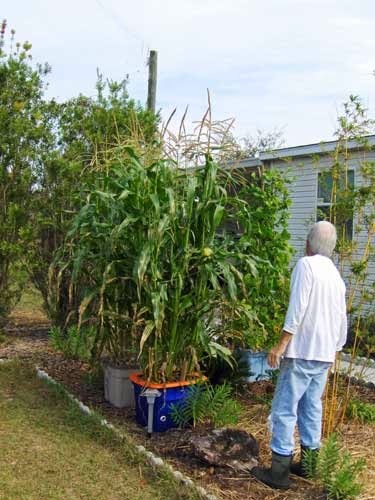 Our corn (which is a very high nitrogen user) grew 8 feet tall in the self-watering containers using only organic methods. High nitrogen user: Corn. 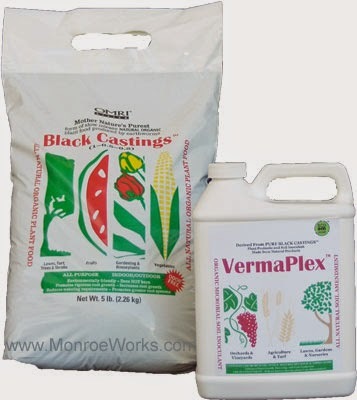 Doing well with worm castings and VermaPlex®. Plants can only use so much nitrogen at a time. While most of the nitrogen from chemical fertilizers simply leach away before the plants have a chance to use it, this excess nitrogen can also burn you plants. 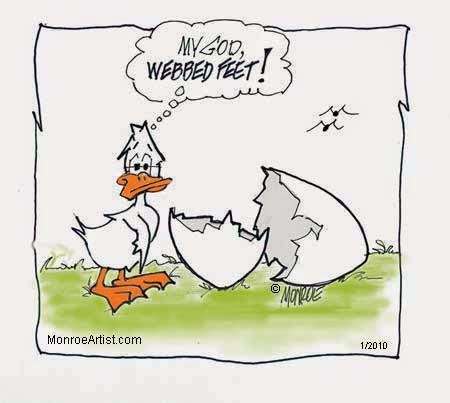 You will never have this problem with organic fertilizers. Safety concerns with comfrey in gardens: Do toxic levels build up in humans from eating plants fertilized with comfrey? Apparently, the research that comfrey can be toxic in humans at high levels raised concerns about its use in gardening. We're cautioned to let comfrey compost for one year before applying it to our gardens. Returning to Organic Agriculture: How changing to, or rather, returning to organic methods and away from business-as-usual to grow our food can help reduce green house emissions. With declining fossil fuels, erratic weather, and water scarcity, we may have no choice but to return to organic farming. The upside - organic methods reduce greenhouse gases. The section on cities and municipalities selling their "toxic sludge" as "organic" fertilizer is an eye opener. Happy New Year from all of us at Monroe Works!